football coaches website design package. Creating an eye catching website design to attract new players to your coaching sessions! Your website will be built in WordPress giving you complete control to make updates, changes and add new photos & videos whenever you want. Each football coaching website we build is fully optimised for mobile and tablets allowing users to browse your services direct from social media referrals. Your coaches website will include as many pages as you require, session pages, booking page (take payments is optional), photo/video gallery, testimonials, latest news, online shop and much more! 12 months free hosting on our fast, secure server. Includes daily backups, security, unlimited emails, SSL cert, .com and .co.uk domain names and 24/7 monitoring. Take bookings & payments for your sessions through your website by credit/debit card (optional). Setup as a one off payment or weekly/monthly subscriptions. We craft each WordPress website we build with a modern design that customers want to see. This will help increase your conversion rate and boost online sales and enquiries. You have full control over your WordPress website to make changes to your web pages, products, content, images and blog. You will receive your own login details and training. Today, football coaches cant get away with having ‘do it yourself’ websites from the likes of Wix or any of these page builders you get with hosting packages from GoDaddy, Hostgator, etc. They don’t carry enough trust with users anymore. 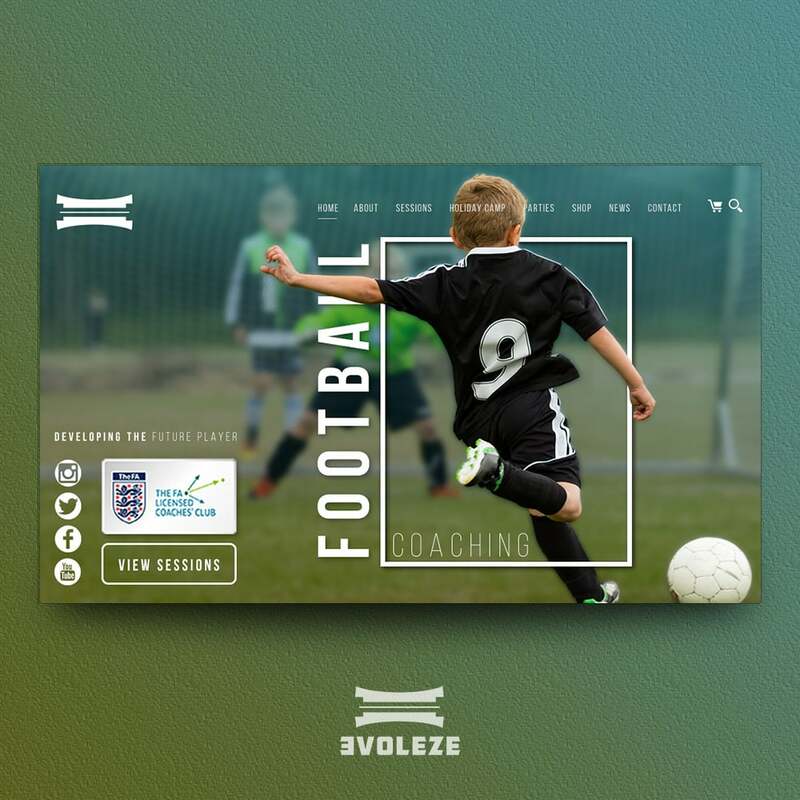 With all the recent events coming to light with young kids and football coaches, its important you give parents that extra bit of trust by putting a trustworthy brand and website design in front of them which clearly outlines your coaching badges, recent DBS checks and testimonials from other parents. It doesn’t matter about your session prices or how good your coaching sessions are, this is the message you need to put in front of parents clearly and professionally. This is what our football coaching website design package does for you! Once you have built their trust through your website then we can get to work converting these parents into new players for your coaching academy. The layout is the next important step after building parents trust. We need to clearly outline when, where, how much and for what age groups your sessions are for. This is achieved by us strategically placing call to actions through your homepage that leads on to more information about each session you run through internal web pages. To have a successful football coaching website we advise having a minimum of 10 pages, which will allow us to create these call to actions and have a good flow through your web pages. We know budgets can be tight, especially if you’re just starting a new coaching club, so 5 web pages is doable. You can always add pages as your sessions get more popular! Using bespoke, professional images throughout your coaching website is far more appealing than using stock images. These stock images stand out a mile and could potentially affect the website and brand trust we mentioned earlier. If you are unable to hire a professional photographer to come to your sessions then taking high quality photos to use on your new website design is strongly advised. The picture quality on phones today should be more than enough to get you started. Please remember to ask parents permission and clearly outline to them that these images will be used publicly on your new website. We recommend them signing a waiver just to keep yourself covered. People searching for new football coaching tend to be using mobiles or tablets as opposed to desktops or laptops. You will find that 86% of website traffic will come from tablets or mobiles so its important we build you website around these devices. We also cater for the remaining 14% as well so your coaching website will look amazing on laptops and desktops as well! With the same factors as bespoke photos mentioned above, bespoke videos of your football sessions are just as important for building that trust and converting users to bookings. If your budget allows it, getting a GoPro to record sessions but again, mobile video quality will achieve the required goal. Now drones… they will capture amazing footage and will pay for themselves in next to no time if you can capture sessions with them! Parents want to see the structure and how you deliver your sessions before they commit to booking. Having regular session videos upload on the website will allow them to have an insight of whats expected and boost the trust factor. Every football coaching website we build comes with a blog or latest news section. Keep people updated with whats happening in your academy/school by updating your blog as often as possible. This can include success stories, new equipment, new coaches, new coaching badges you achieved… the content is endless. As a coach myself, i know collecting subs is a pain in the arse! You don’t 100% know how many kids will be attending your session or how much you will be getting paid. If parents book online and automatically pay you each week/month by a credit/debit card subscription, you can take that hassle away. This is completely option with your website design. If preferred, you can just have a booking/enquiry form. Linking out to your Instagram, Facebook, Twitter and YouTube pages is vital for keeping people up to date with your coaching academy. People wont always come to your website to read your latest news (actually, they will hardly do that at all). They need to be able to see everything in front of them while they’re browsing social media. We make sure that all of your social media accounts can easily be followed by website visitors by adding follow buttons and feeds on all web pages. If you have training wear you want to sell on your brand new website design then we will setup an online shop! Customers can pay by card and have the option to have the products delivered or collect from your next coaching session. With clothing, users have the option to select which size they require, quantity and personalisation (if you offer that). Once the orders complete you will receive an email with all the customers order details and payment confirmation. To get maximum exposure to your coaching website then you need to rank in the top 3 positions on Google… but this isn’t easy and doesn’t happen over night! As nearly all coaches operate in a local area, we provide an affordable local SEO package to help with these search engine rankings and social media exposure. If you run a nationwide academy or franchise we do offer UK digital marketing packages to help you gain maximum website exposure. If you have any questions regarding our football coaches website design package then please don’t hesitate to call, chat or email.